It’s a running joke in my family — you know you’re loved when we try to fatten you up. Food is our love language. We believe in the healing power of scratch-made chicken soup. We believe that the rawest display of our love is the blisters we earn curling piping hot lace cookies into beautiful straws for your Christmas party. We believe that recipes are felt, not measured, and that you’ll just know when you’ve made it correctly. We believe that food is what ties us together in this great big world. As a life-long homeschooler, food was central to my early life. Shopping for groceries was a lesson in economics. Baking was considered chemistry and math. History, culture, and language all bundled into our time in the kitchen, whether we were creating pastries that looked like dormice, an ancient Roman delicacy, or translating the tight, messy cursive of my grandmother’s hand-me-down recipes into something we all agreed was a close approximation of a recipe that was rarely actually followed to the letter. Food was our soul, and cooking was an act of devotion to ourselves and those we loved. It also was our shared talent, something indescribable that we all owned. I don’t think my mother ever actually followed a recipe in my life. She, and now I, collected stacks of cookbooks and sheaves of recipes printed off from the internet or torn from magazines, all covered in smudged pencil annotations. Our favorites were dogeared and smeared with the grime of cooking, cataloged in no real meaningful order. Our measuring spoons went oft unused — we preferred the lines tracing the hollows of our palms to tell us how much we needed to add. Spoons dipped into bowls and pans frequently, tasting and tweaking. Tenderness was a soft breath blowing away steam before offering it to the other for a taste. Our shared status as veterans of commercial kitchens showed as we worked back-to-back, elbow-to-elbow in the dark confines of our sorely outdated galley kitchen, hemmed in by dark oak cabinets and peeling Formica. A rotating cast of dogs, cats, birds, and goats danced underfoot over the years, all scurrying to safety beyond the edge of the knife-scarred linoleum (a testament to my mother’s temper when provoked) when a kitchen towel snapped in their direction. That kitchen, like those pets, is gone now. The tragically outdated oak cabinets got a fresh coat of crisp white paint. The peeling, lifting grey Formica was replaced with neatly bull-nosed granite countertops. The knife marks in the linoleum were covered over in laminate wood flooring, snapped together like a jigsaw puzzle. My parents bid farewell to that quirky house that sheltered us for nearly 30 years — and all the dead pets buried in the back yard — and moved far away. When I miss my mom, I cook. There’s something comforting about breaking out an old church cookbook and flipping until I find a well-loved recipe, her name printed neatly beside it. These recipes, of course, are never made according to her half-assed directions, but rather altered with pencil annotations and struck-through ingredients to suit my tastes and allergies. I often pick up the phone when I get home from work, dialing her number as I open the fridge to survey the contents. “Hi, babydoll. Whatcha doin’?” She always answers. “Not much, just making dinner,” I always reply. “Whatcha making?” She always parries, and we’re off, discussing what we’ve eaten lately, what recipes we’ve discovered and can’t wait to try, what tweaks we’ve experimented with on old favorites. Food is our love language, our way of connecting with each other and establishing a comfort zone to speak freely with each other. Don’t make the mistake of believing that I’m stuck reliving the past over bubbling pots, though. Some of my greatest creations have been inspired by things my mother would never attempt — and she loves to remind me over the phone as I try to describe the light-as-air swirl of hand-painted peppermint meringues I made for Christmas before finally capitulating and agreeing that they weren’t my personal favorite, but damn did they look great on Instagram. I snap my latest and greatest kitchen achievements and post them just for her — my Instagram is full of breads and cakes and layered Jell-Os that wobble to pieces seconds after photographing them. She leaves me heart-eyed emojis and expressions of jealousy at not being able to taste, and I assure her I’ll plan to make that berry pie for her again when I next visit. 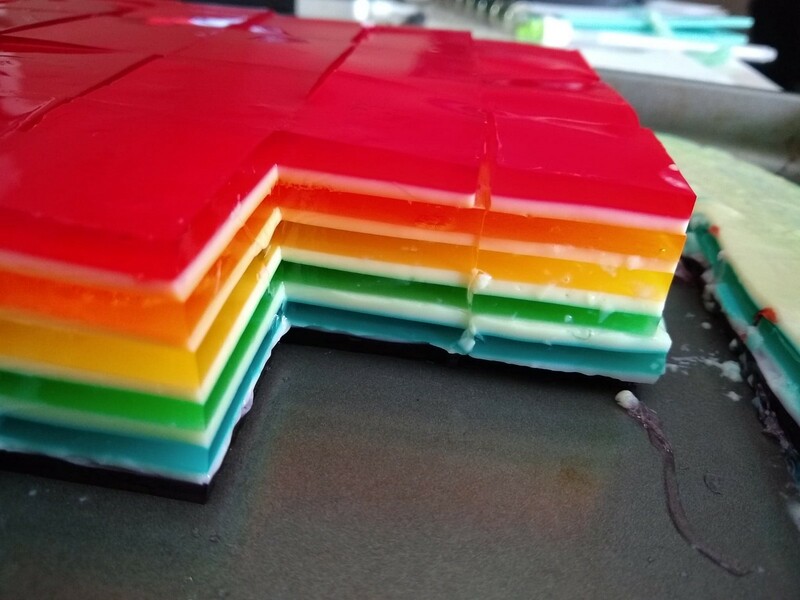 The ill-fated rainbow Jell-O, via la_firecracker on Instagram. Cooking is our common thread. No matter how far away we are, I know that all I have to do is light a burner and get out a skillet to begin feeling a little closer to her. When I miss my mom, I cook. Want to keep up with me? Follow me on Twitter: @AlleyWritesGood.